In celebration of the new year, *VoguE* has launched a mini hunt. There are four items around our sim containing gowns, dresses, makeup, gift certificates....can you find them? Hurry over, this is a FREE hunt and will only be available through December 31. You are looking for the red and black presents pictured. 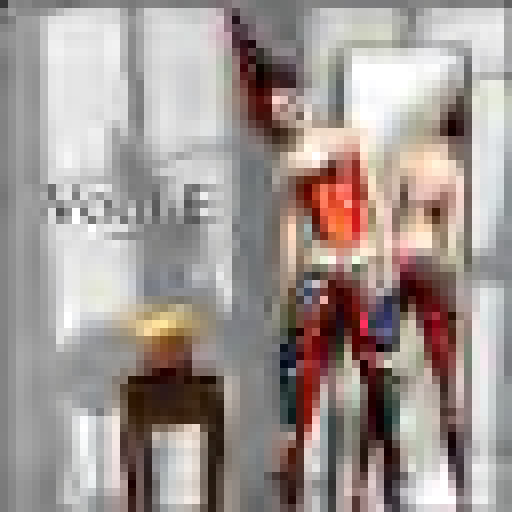 Arriving at *VoguE* is the new Winter Collection. This piece is the Lorraine Winter Dress, a knit dress with a cowl neck yet sporting open shoulders and arms. 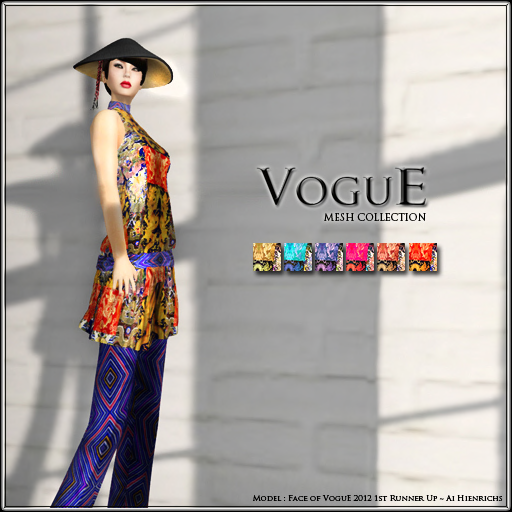 Available in six color variations you can find it only at *VoguE* Mainstore. 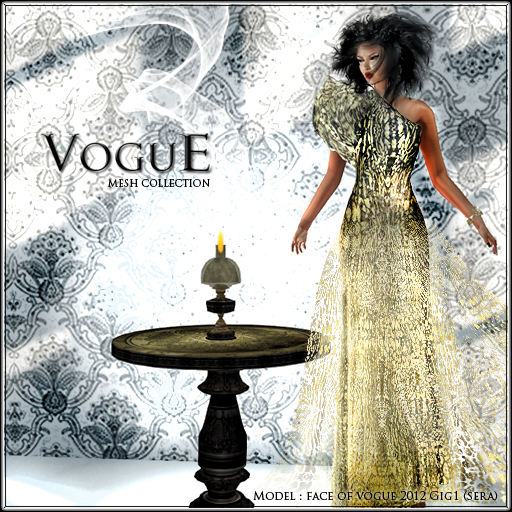 VENUM KNIT WEAR debuts at *VoguE* on Saturday, December 15 at *VoguE* Mainstore. 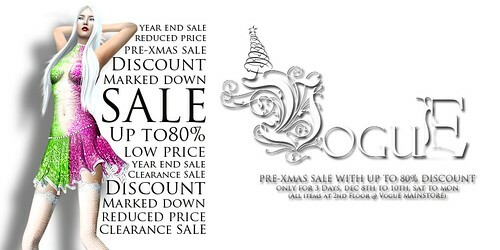 On the second floor of the store....up to 80% off. 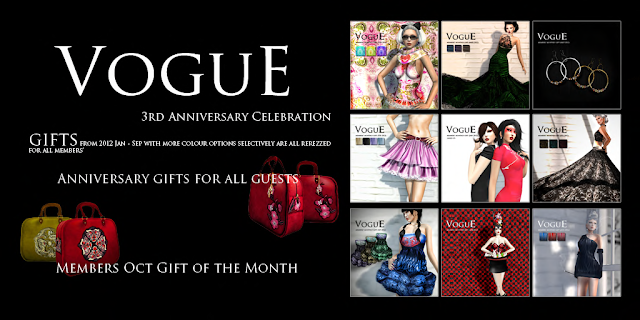 VoguE Fashion, secondlife – a fashion provider for ladies celebrates its 3rd anniversary this month. 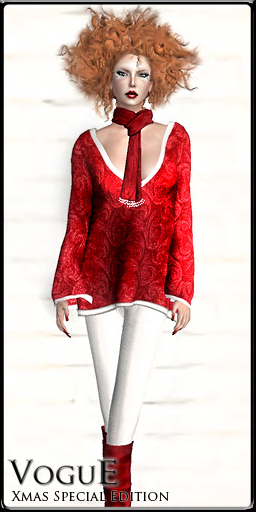 Since its founding in late 2008, has delivered multi women apparels for its customers across secondlife. 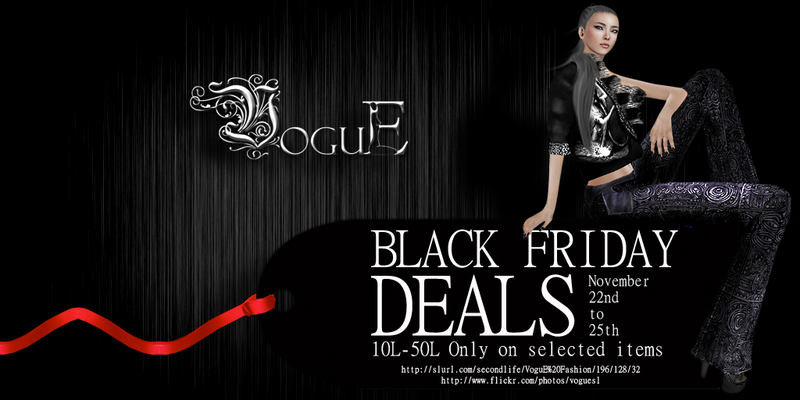 VoguE is a women’s fashion brand that delivers clothing solutions for ladies in Secondlife. The brand now has over 14,000 valued members both in world and SubOMatic. 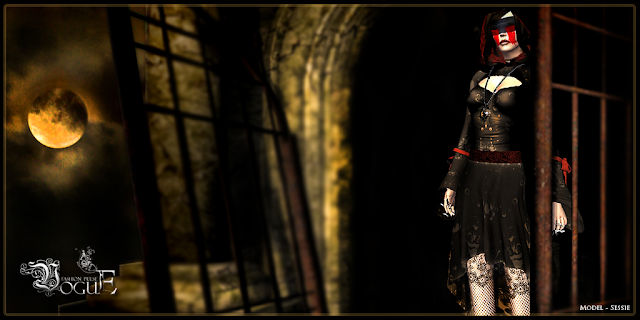 2 DAYS SALE, October 13 & 14 (slt), 50% Storewide on lingerie, casual and formal wears. Starting this weekend, our October Members Exclusive Gift is available to thank our group members for their continued support. The Asian Print Travel Bag in both gold and red is available. This wonderful bag coordinates with our "Asian Invasion" collection that debuted during BOSL Fashion Week and is being released weekly in the store. For guests, the bag is available in red. IN ADDITION......starting this weekend we are placing out our former Exclusive Member Gifts, some in ADDITIONAL EXCLUSIVE COLORS. These are available once again to our incredible group members, one of the perks! Keep checking back weekly to see what other goodies will be arriving to celebrate our anniversary!!! MESH Dress, for a limited period. An appreciation to our members' for your great support.